Representations and descriptions of both active and inactive rank insignia worn by Chicago Police Department members. 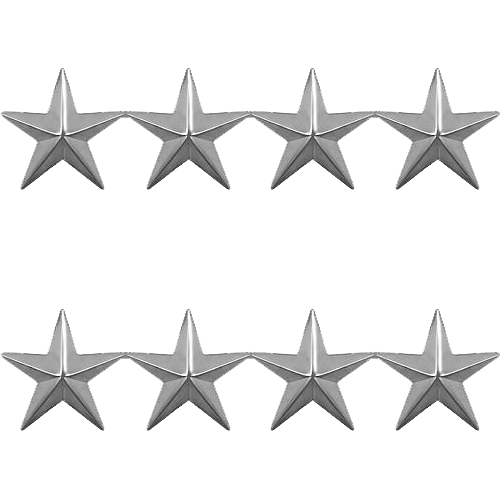 Description: Four silver tone five-point stars with ridges to be worn on the epaulets of the outer garment (e.g. Blouse, Refer, etc.). Miniature Insignia: The wearing of miniature insignia on the shirt collar has been authorized two times. The first authorization became effective on July 25, 1960 and was de-authorized effective December 31, 1960. The second authorization became effective on September 30, 1989 and is presently authorized. Miniature insignia were authorized for wear on the shirt collar and matching full-size insignia were to be worn on both the left and right epaulets of an outer garment excluding the uniform shirt. 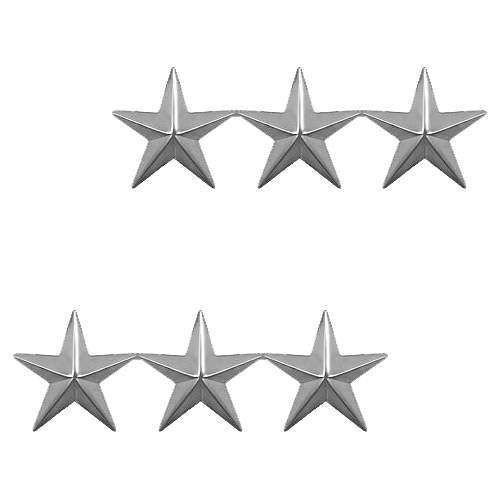 Insignia Dimensions: Full-Size Shoulder Insignia – 1″ in diameter each star. Miniature Collar Insignia – 5/8″ in diameter each star. Positioning of Insignia: Full-Size Shoulder Insignia – Centered on the epaulets and spaced evenly between the button and outer shoulder seam. Miniature Collar Insignia – Centered on a horizontal line between the top and bottom edges of the collar. The leading or forward edge is 1/2″ from the front edge of the collar. The upper point of the insignia will point toward the top edge of the collar. 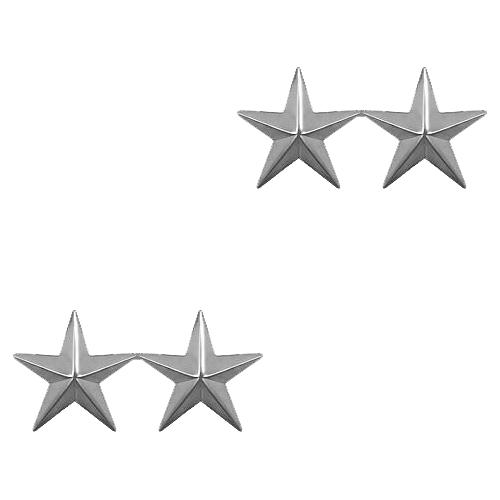 Description: Three silver tone five-point stars with ridges to be worn on the epaulets of the outer garment (e.g. Blouse, Refer, etc.). 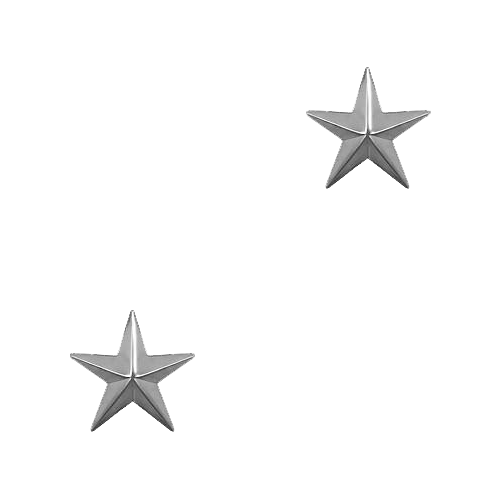 Description: Two silver tone five-point stars with ridges to be worn on the epaulets of the outer garment (e.g. Blouse, Refer, etc.). Description: One silver tone five-point star with ridges to be worn on the epaulets of the outer garment (e.g. Blouse, Refer, etc.). Description: A single silver tone spread eagle worn on the epaulets of the outer garment (e.g. Blouse, Refer, etc.). Insignia Dimensions: Full-Size Shoulder Insignia – 3/4″ in height and 1 1/2″ in width from wing tip to wing tip. Miniature Collar Insignia – 15/32″ in height and 31/32″ in width from wing tip to wing tip. 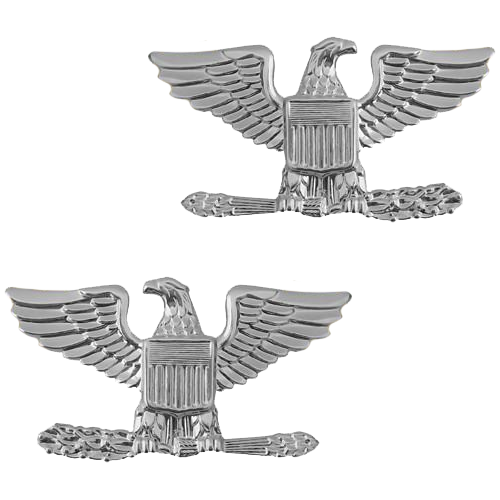 Positioning of Insignia: Full-Size Shoulder Insignia – Centered on the epaulets with a space of 5/8″ between the lowest edge of the insignia and the outer shoulder seam with the beak of the eagle pointing toward the uniform front. Miniature Collar Insignia – Centered between the top and bottom edges of the collar. The bottom edge of the laurel branch will be parallel to and spaced 1/2″ from the collar front. The beak of the eagle head is to be directed towards the neck of the uniformed member. Description: A single gold tone spread eagle worn on the epaulets of the outer garment (e.g. Blouse, Refer, etc.). 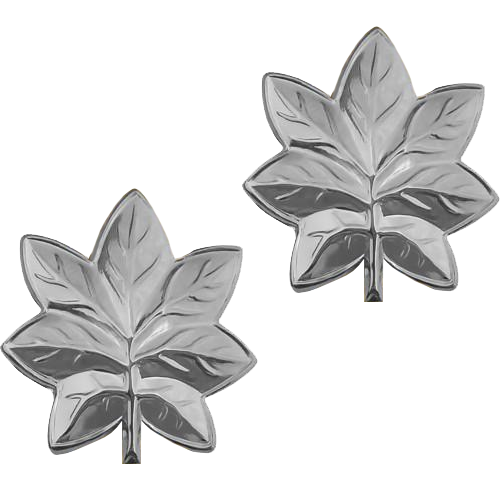 Description: A single silver tone oak leaf worn on the epaulets of the outer garment (e.g. Blouse, Refer, etc.). Insignia Dimensions: Full-Size Shoulder Insignia – 1″ in diameter. Miniature Collar Insignia – 3/4″ in diameter. Positioning of Insignia: Full-Size Shoulder Insignia – Centered on the epaulets with the bottom edge of the stem spaced 1/2″ from the shoulder seam. Miniature Collar Insignia – Centered between the top and bottom edges of the collar. The bottom edge of the stem will be directed toward the collar point. The leading edge of the insignia is to be 1/2″ from the front edge of the collar. Description: A single gold tone oak leaf worn on the epaulets of the outer garment (e.g. Blouse, Refer, etc.). 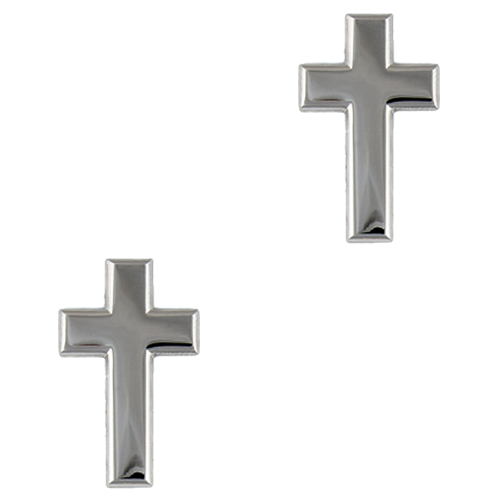 Description: A single silver tone cross worn on the epaulets of the outer garment (e.g. Blouse, Refer, etc.). Insignia Dimensions: Full-Size Shoulder Insignia – 1″ in height and 3/4″ in width. 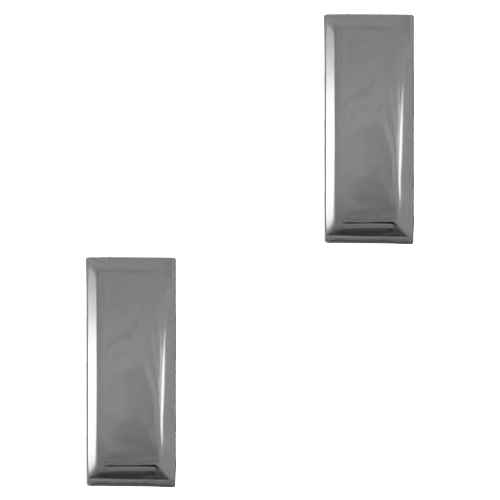 Miniature Collar Insignia – Not specified for this rank insignia. Positioning of Insignia: Epaulets – Centered with the bottom edge of the cross placed towards the shoulder seam. Collars – Centered near the collar points with the base of the cross closest to the collar point. 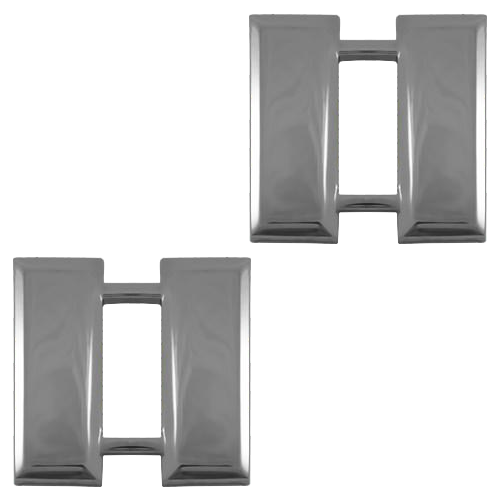 Description: Two silver tone bars worn on the epaulets of the outer garment (e.g. Blouse, Refer, etc.). 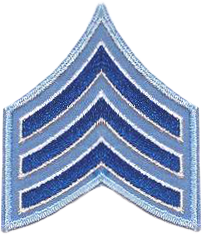 Insignia Dimensions: Full-Size Shoulder Insignia – 1″ in height and 1 1/8″ in width, each bar measuring 1/4″ in width. Prior to November 1, 1981, the bar was 3/8″ in width. Miniature Collar Insignia – 7/8″ in height and 1″ in width, each bar measuring 3/16″ in width. Positioning of Insignia: Full-Size Shoulder Insignia – Centered on the epaulets with the length of the bars parallel to the shoulder seam. The longer edge of the bars will be spaced 1/2″ from the shoulder seam. Prior to November 12, 1991, the bars were spaced 5/8″ from the shoulder seam. Miniature Collar Insignia – Centered between the top and bottom edges of the collar. The longer edge of the bars will be spaced 1/2″ from, and parallel to, the front edge of the collar. Description: One silver tone bar worn on the epaulets of the outer garment (e.g. Blouse, Refer, etc.). Insignia Dimensions: Full-Size Shoulder Insignia – 1″ in height and 1/4″ in width. 1″ in height and 3/8″ in width. Prior to November 1, 1981, the bar was 3/8″ in width. Miniature Collar Insignia – 7/8″ in height and 3/16″ in width. 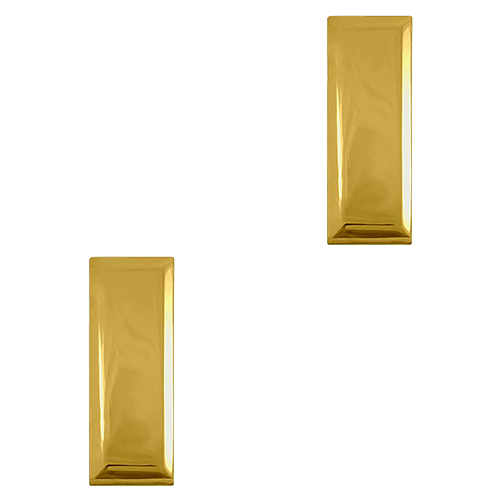 Description: One gold tone bar worn on the epaulets of the outer garment (e.g. Blouse, Refer, etc.). Description: Three chevrons worn on the sleeves of the uniform shirt and outer garment (e.g. Blouse, Refer, etc.). A matching stacked set of three chevrons will be worn on both the left and right sleeves. Insignia Dimensions: Uniform Shirt – 3 1/4″ in height at the vertical center line and 1 7/18″ in width. Outer Garment – 2 5/8″ in height at the vertical center line and 1 1/2″ in width. Positioning of Insignia: Centered on the sleeve with the points of the top chevron positioned between 4 3/4″ from the shoulder seam for chevrons sewn on uniform shirts and 5 1/2″ for all other outer garments. 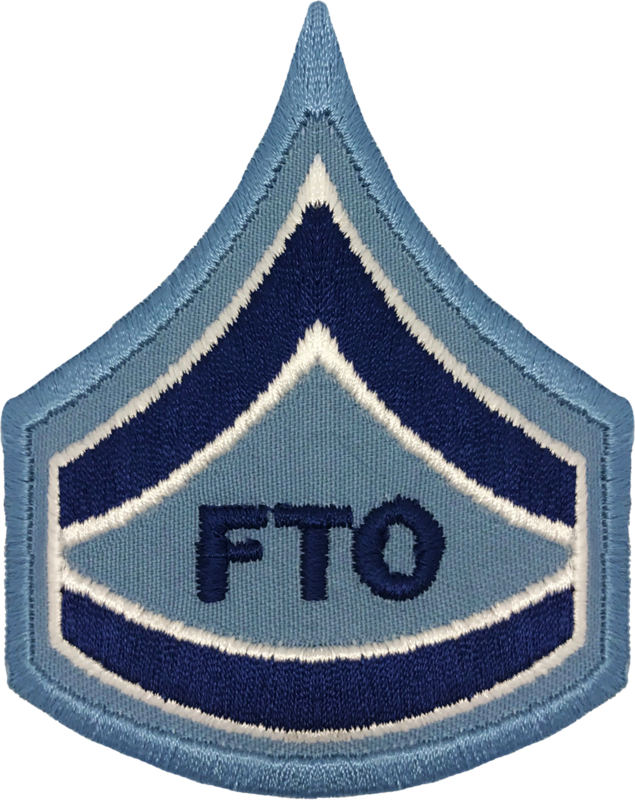 Description: A single chevron stacked above a single rocker with the letters “FTO” positioned in the center worn on the sleeves of the uniform shirt and outer garment (e.g. Blouse, Refer, etc.). A matching single chevron stacked above a single rocker with the letters “FTO” positioned in the center will be worn on both the left and right sleeves. Insignia Dimensions: 3 1/4″ in height and 1 1/2″ in width. Description: A single rocker over a gold tone ball tipped five-point star with ridges worn on the wearer’s right breast of the outer most garment (e.g. Blouse, Refer, Uniform Shirt etc.). History: Beginning January 1, 1976 and ending on March 15, 1999 the Chicago Police Department utilized Patrol Specialists to train recruits once they had graduated from the Training Academy. 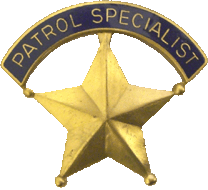 The Patrol Specialist Badge was issued to Officers that had the responsibility to train the new recruits. The initial batch of issued badges were numbered from 1 to 200. The number was stamped in the upper point of the star on the reverse side. 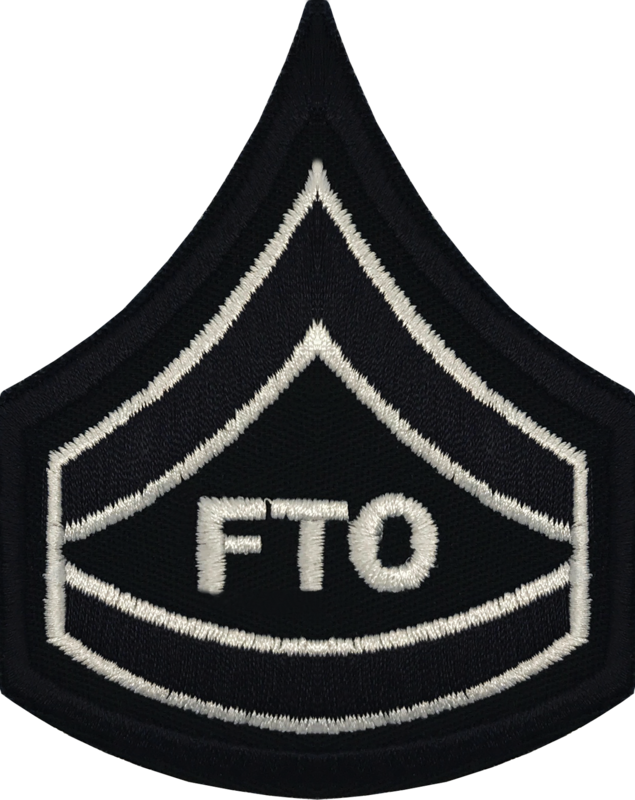 Currently Officers charged with this responsibility hold the rank of Police Officer assigned as Field Training Officer and wear a single chevron stacked above a single rocker with the letters “FTO” positioned in the center. 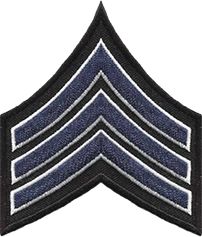 This rank insignia is worn on both the left and right sleeves. Insignia Dimensions: 1 1/4″ in height and 1″ in width. Positioning of Insignia: Worn on the outer uniform garment. The badge will be centered and pinned 1/4″ above the member’s nameplate. When the member is wearing their award ribbons, the badge will be positioned 1/4″ above the upper most ribbon bar. Description: This rank does not have any rank designatior assigned. The only designation for these ranks would have been a title on the police star. Description: These ranks did not have a rank designator assigned to them. The only designation for these ranks would have been a title on the police star.